Hugh MacLeod is most famous for his GapingVoid cartoons, a mixture of optimism, cynicism, humour and philosphy. 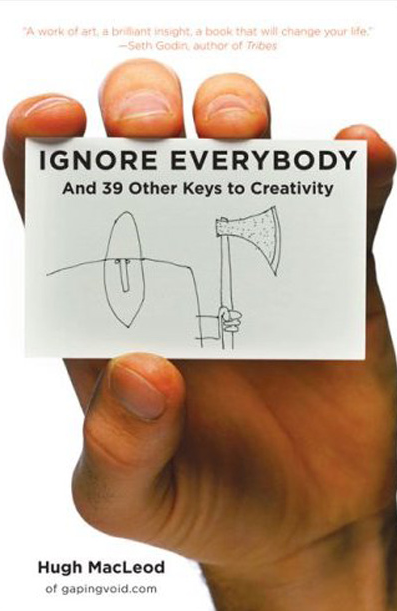 This book, a version of which can be downloaded from ChangeThis, encapsulates his thoughts on being creative. He takes particular joy in pointing out the counter-intuitive, although somehow once he’s said it I end up thinking it was obvious. I’ve dipped into the book, rather than read it cover to cover. Each chapter is a “lesson”, written in fairly direct tones but with plenty of humour and examples. And of course there are the wonderful cartoons – all drawn on blank business cards. The content is aimed at people being creative for a living, although rule 8 is ‘keep your day job’, but there’s plenty of inspiration and advice here for those of us just wanting to spice up our day jobs with a dash of creativity. Even if you think you’re not creative, the charm and wit of this book might convince you otherwise. Hugh MacLeod’s quirky point of view.